Denim overalls made from the new Art Gallery Fabric denim line. The next Petit a Petit pdf pattern in the works. Oh look it's me again! It's a been fun blogging again, hopefully I can keep this pace up. I am very excited to be part of the Debut Holiday blog tour. I had the privilege to sew up not 1 but 3 cute items from some super talented ladies all new to the world of pdf patterns. All three are awesome patterns, easy to put together, clear instructions, notches in the right place and fun to sew! Seriously looking forward to seeing what they'll be creating next. and a floral wreath crown to tie the look together. is a super sweet sleeveless dress with curves at the princess line and delicate gathers. I absolutely love that the inside is as pretty as the outside with french seams and a lined bodice. I also really love the bias finish at the neckline and armhole. I made MissE a size 6x with the intention of her growing into it. So it's a little wide at the chest, but she will probably be wearing it with a long sleeve tee until this summer. The length is also great for now and she has plenty of room for her to grow. The only modification I made was to add a cute little faux collar and I omitted the bias at the princess line. I knew I wanted this dress to be simple but couldn't resist the urge to make it a little special. If you would like I can have a tutorial for this simple add on. The main dress fabric is a slightly stretchy tomato red sateen. It has just a little shine to it, but you really have to look hard to see it. It is super soft to the hand, yet still has a little stiffness to it perfect for this style. However, it is a pain to iron! The collar fabric has been in my stash for maybe 10 years now. It's a cotton with small flocked white bow pattern. I have hardly any left and use it very wisely. I wish I knew where to get more! And just look at that back! Swoon. And look at that face ( and that smile it, see if you can spot a difference in a photo below)... a very happy girl with her new dress. The wreath crown... not so much. Haha! It was a little itchy and poor kiddo was a little sick and not so much in mood for extra props.
. Well now they are knee high socks, but they started out as tights. I am definitely going to give these a try again. The pair I made ended up a little big and I ran out of time to make them again. The difference in fabric and stretch probably was the reason they ended up being too big. I had used 2 different fabrics to create them, so just ended up cutting them where the sock part ended and added some elastic to hold them up. I absolutely love the knee high socks and end result. I've had this sweater in my up-cycle stash forever and I just love texture in tights. I was going to use the sweater for the Fishtail Kimono, but felt like the red and green was a little too Christmas-ee, so I changed things around and made the socks with them instead. And how cute are these bambi shoes from H&M? Too bad they are too small already. MissE insisted on wearing them for the photos anyways.
. I changed my mind at least 5 times and finally settled with this grey faux knit sherpa. I was going to make myself a Cocoon coat with it, but it's been sitting on my desk for a year now. MissE always ends up with the good fabric! I wasn't sure if the thickness of the fabric would work with the style, so I knew my good friend Mie had made the Fishtail and asked her what she thought of the idea. She was pretty excited about it, so I tempted my chance and went ahead and cut into the fabric. I was going to size up, but decided to go with the recommend size for my daughter's measurements. So happy I did. I did widen the neckband a nudge as I wanted it to overlap ever so slightly. After cutting the neckband on bias and not loving my sewing job, I ripped that out and recut it on the grainline as well as added 2cm to the length of each panel. It was well worth all the trouble. And I used the old neckband to make a belt. So nothing went wasted. I added two small openings in the side seams, so the belt would pass trough it and that way it not disturb the beautiful pleats at the back. Oh and lucky me, I had an exact match for the neckband fabric in my stash. It's a water resistant polyester type fabric, that melts when you iron it, yeah don't ask how I know! And look how awesome the back is? Such a nice little surprise! As you can see the gathering worked well the thickness of the fabric. I also added some cuffs to the style to give it more of a coat look. One thing I would change if I were to make the Kimono in a thick fabric again, is to move the shoulder seam forward by 2 or 3cm. I found the seam of the sleeve kept rolling back and not sitting at the right place on the shoulder. A very simple adjustment to make it fit perfectly. I just love this style, looks great in so many different fabric, it's super simple and fast to sew and looks super cute and stylish. I am excited to try it again, as well as the other two patterns. Now I couldn't resit taking some photos outside as the weather has been so nice and way above average for this time of year. We took a little stroll after early dismissal yesterday and put this outfit to the test. Sorry for the photo overload. Don't forget to check out what everyone has been up too- So many good holiday outfits! I present to you the Mini Hudson Pants, a pattern by Kelli at True Bias. I am excited to be part of the blog tour for this newly released sweatpant pdf pattern. I've been eyeing the woman's pattern for while and was presently surprised to be invited on the tour for the mini version. This is a simple pattern, perfect a beginner project in my opinion. The pattern has notches to guide you, the explanations are clear and concise. As for the styling, it has a fun detail at the pockets, cuffed hem and an elasticized waist. According to the measurement chart MisterM was a perfect 7 and so that is the size I made. I was worried it might be too wide in the hips, but I was wrong. The fit is spot on. I love the skinny leg and roomy hips, perfect for comfort and style all in one. The only modification I made was to widened the cuff at the hem since my fabric had zero stretch ( which is not recommended!) in it and was worried MisterM wouldn't get his foot in. It ended up being just like I wanted. Next time, there will be many next times, I will make them longer. I should have really checked the inseam measurements, I think MisterM might have his moms long legs. They fit perfectly now, but for how long? I also made MisterM a sweatshirt, it's self drafted. I used some stretch terry I had in my stash, an upscycled navy t-shirt and that famous ponte stripe I love so much. The sweatpants are made with a fleece fabric I got over year ago at my local fabric shop, it's off white with grey slub yarns in it. The grey and white stripe is a ponte knit I also got last winter, maybe you remember it from the hot shorts I made MissE for my California look on Project Run & Play. To complete the outfit I made a Wintercroft cardboard mask which I purchased the template here. I am in love and now want to make the entire collection of masks available. It took me a few hours to cut and assemble but the mask came together beautifully. Mister M and I had a lot of fun with this photoshoot, so I will let you enjoy it! In case you were wondering we shot this in the evening, no flash was used only a 150 watt light bulb from a desk lamp and overhead incandescent lamps. My amazingly talented and good friend Mie from Sewing Like Mad is showcasing a girl version of the Mini Hudson pants today and I can tell you they are A-M-A-Z-I-N-G maybe even a little very shiny! Check it out and tell her I say hi! and to purchase the Mini Hudson pattern it's THIS WAY. Thank you so much for having me be part of the tour Kelli. I can't wait to see what other patterns you'll be concocting, I am excited for the future! Have you heard? It's nani IRO month over at Miss Matatabi's. I kind of wish it was nani IRO year! If only I could sew with this amazing Japanese fabric for every project- ohhhh dreamy! I am super and honoured to be part of the blog tour and I had the privilege of choosing some fabric in exchange for this post. How could I refuse such an amazing opportunity, some of my favourite items were made with nani IRO you can see the sweetest tunic here and remember my Project Run & Play hi-lo tunic, see it here! This time I knew I wanted to make myself something and couldn't resist doing a mother-daughter outfit! I made myself a dress with the loveliest Kokka nani Iro Water Window wata double gauze. I just love the oversize checker board print, it looks as though it was hand painted. I was pleasantly surprised how little it got wrinkled after a days wear. I shortened the dress a little too much, I guess I have enough now to make MissE an exact copy of my dress as per her request! However, it is perfect for wearing with skinny jeans and will be great for all seasons. I finished the hem with some floral nani IRO bias tape which I bought a while back at Miss Matatabi's- oh so sweet. I also made a bag. I LOVE my bag. It is oversized but light weight. It can carry sooo much, perfect for travelling with kids or going to the beach. I used some Kokka nani IRO Pierre Pocho Canvas. How awesome are those polka dots? It's a lovely cotton and linen blend, just perfect for so many applications. I used a vintage leather belt I had for the straps and added a magnetic snap for easy access. Here we are testing the bag out! I used the same Canvas to make MissE's romper. I love the simplicity of this pattern. The open back is super cute. I might sew the straps to back so MissE can put it on and off as she desires. She thought it was funny her dress was actually shorts! She was even more excited her romper matched by bag. The fabric was a perfect choice for this pattern, i was worried it would be too thick or stiff but it turned out perfectly. The dress is from the Simple Chic Japanese Pattern book. The Bag from this Umami Japanese bag pattern book. The romper from my favorite author Ennana. Just click on the photos to shop ( the first 2 are affiliated links). The amazing fabric is available at Miss Matatabi's Etsy Shop- her international rates are awesome, her service impeccable and selection to die for, I have ordered from there a couple of times and will keep on shopping there. Check out the double gauze here and the Pocho Canvas here, note there might be some variations in color also if the item is sold out it will most probably be back in stock real quick. The best part of making a mother-daughter outfit, is that I get some fun photos with my daughter. I need to work on a mother-son outfit next! I really need to thank my husband for these awesome shots. Now you are going to want to check out what everyone else is up to this month and if you are sewing with some nani IRO don't forget to tag your photos with #ilovenaniiro so we can all follow along. Thank you Frances for inviting me to the tour. I MADE... Calling All Kids!!! "No florals & pink" were the first words uttered by my husband when we found out we were having a boy, right there an then at the ultrasound. He knows me well! This was 6 years ago and I have finally sewed my first pink thing for Mister M, thanks to the awesome series called "Calling All Kids" hosted by the ever so amazing and talented Alida of Alida Makes. Calling All Kids is a series that explores children’s clothing as it relates to gender. I know most of the clothing I buy or sew is usually pretty neutral. Miss E has no problems wearing all of Mister M's hand me downs and we aren't great fans of all things princesses and monster trucks. We usually leave these items to pyjamas or underwear. However, when it comes to boy stuff, it's always a little trickier. So you can imagine my excitement when I got invited to this series. I knew what I wanted to make right away: Florals & Pink. I usually ask my husband for his approval when I am making something for Mister M that isn't quite "conventional" like for this shirt and these ties, but nope not this time. And guess what, he loved it! His words were: "the shirt is so awesome and I actually like the shorts too!". Say what? I was pleasantly surprised. I guess it's all how you do it! I found this lovely floral at my local fabric shop, it has a little stretch to it and has just the right amount of flowers on it. I self drafted the shirt, loosely based on a shirt Mister M already owned. I curved the hems and added snaps for the closure. I made the neckline a little wide, I will know better next time. Then I upcycled some washed out pink pants I found at the thrift store. I kept the side posckets, back welt pockets, as well as parts of the original waistband. This kid is ready for a summer, wouldn't you say? We had fun with the photoshoot, I took the photos in my tiny studio with some crazy fabric I have from Ikea. Mister M pretended to be in a tropical forest. He took on his role quite seriously. Those back pockets are quite wide! The quirks of upcycling- I love it! I am happy to know the whole family liked this little outfit. I think there might be more pinks and florals in Mister M's future! What do you think? I am on the last day of the tour, so I strongly suggest you check what everyone else has been doing- it's been all soooo much fun. Check out my friend Mie's blog Sewing Like Mad today for a super cute girly not so girly outfit. Thanks you so much Alida, this was such a fun sew!!! Don’t forget to enter the giveaway! For some amazing prizes. Click on the link below. I am so excited to share with you my latest sewing project. I feel like it's been so long. I guess the last thing I sewed for my kids goes back to december. Wow! 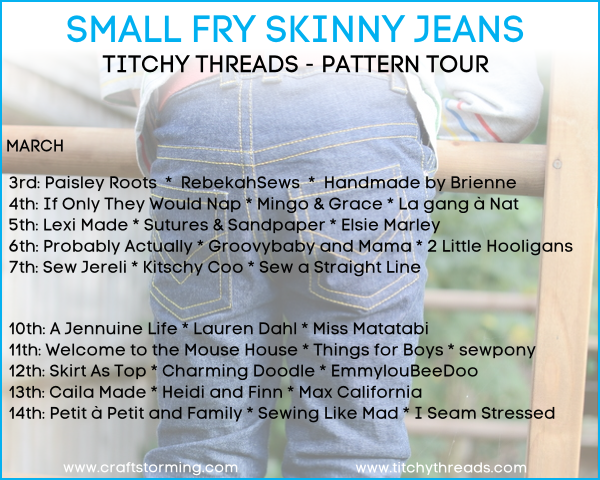 So today I am sharing my amazing and crazy talented friend Laura's from Titchy Threads latest pattern the Small Fry Skinny Jean. Have you been following the tour? It's been so amazing to see such professional and great looking jeans pop up in my feed for the last 2 weeks. I personally had so much fun with this pattern, I had already sewn a pair of Small Fry Skinnies for Mister M for my 12 days post, so I figured it would be a nice challenge to change it up a little for MissE and remixed the pattern into a dress. All in all the pattern remained the same, I basically straightened the front and back crotch and kept all the other details the same. I then added the front panels and the shoulder straps. And done! Everything about this pattern is exceptional, from the different printing options- you can print one size or all, or perhaps you prefer to send your files to be printed at the print shop, which means no taping or cutting. Say what? Yup for less than 3$! Crazy right. I still have to see if my local print shop provides this service. I sure hope so. Next are the instructions, Laura will guide you step by step and will make you sew up your jeans like a pro. We are talking flat felled seams, coin pockets, zipper fly, half fly, adjustable waistband, belt loops, etc... You name it, she has thought of it and she makes it so simple and easy and guides you the whole way through. And well shall we talk about the pattern itself? The fit is awesome. If you measure your kid correctly and adjust accordingly you will get the best fitting jeans ever. Your kids will love them, you will love them. Seriously, MisterM won't take his off. Don't be scared of all the details, they are all well worth it. Actually, the pair I made Mister M didn't take me that long- I skipped a few steps, like the coin pocket and I didn't double topstitch everything and they came out looking awesome and even on the dressy side. Oh, but I didn't leave anything out for Miss E. I even added the rivets and brass buttons. 7 buttonholes!!! If you know me, you know that that is a big deal! I had a little fun with the topstitch on my fly and went "wild" on my back pockets. I didn't use topstitch thread as I had some really bad experiences with my sewing machine in the past ( don't get me started with my piece of junk machine) but I did use neon pink thread! And yes, I did run out and had to go buy some more! So I am personally not 100% happy with the result of my topstitching besides the crappy sewing machine, I also made my shoulder straps too long and had to redo the waistband once I had installed the buttons and rivets. Note to self- fit your clothes before you finalize them. All in all I am happy with the results, most importantly MissE is loving her new dress. Now we are patiently waiting for the warm weather to come our way and dreaming of eating giant ice-creams. This photoshoot was our attempt to bring the summer indoors. In case you are wondering, the top MissE is wearing is actually a dress by Neige courtesy of Ladida. The tights are from H&M. The moccasins are by Manimal. You can see more of the details here. And the insides on the photo below ( I felt compelled to do like everyone else on the tour!). It is all just so pretty inside out! Laura concocted one amazing pattern with so many possibilities. I had planned on doing many more pairs for the tour but things came up and was unable to cut up my aqua and yellow stretch denim you see in the backdrop of the photo shoot ( at least they served a purpose). I expect to make some shorts for the kids this summer and many more jeans, since it's pretty much all my kids wear. Funny thing is that MisterM & MissE wear pretty much the same size bottoms, so lucky me they will be able to share! So check out the Titchy Threads websites for all the details. And grab a pattern- you know you want to! Laura is giving everyone a discount up until March 15th- get 20% off with promo code TOUR20. Don't forget to have a look at all the amazing Small Fry Skinny Jeans that have been created by some super talented ladies. Florals to the real deal, all in all some crazy amazing stuff I tell you! Thank you Laura for providing me with this amazing pattern and having me on your tour. I seriously LOVE it.